Herman Cain Gets 'A Colbert Bump' In South Carolina : It's All Politics Could Herman Cain's one percent of the South Carolina vote be thanks to a late-breaking endorsement by Comedy Central comedian Stephen Colbert? Former GOP presidential candidate Herman Cain waves at a rally the College of Charleston on January 20, 2012. 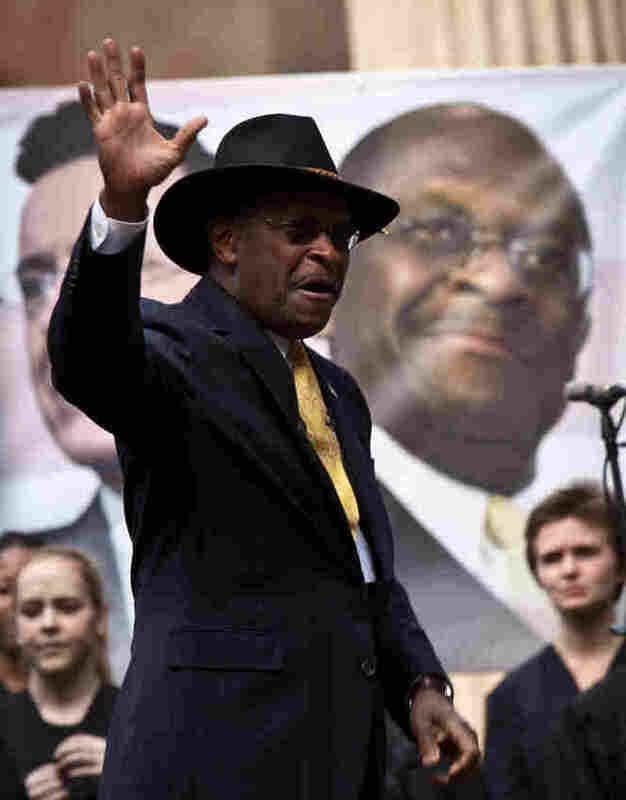 Comedian Stephen Colbert held the event with Cain, titled "Rock Me Like a Herman Cain South Cain-olina Primary Rally", as part of his pseudo-run for president of "The United States of South Carolina." Herman Cain suspended his bid for the GOP presidential nominee back in December, but that's not stopping him from picking up votes in South Carolina's primary. Could his mini surge of one percent of the vote be thanks to a late-breaking endorsement by Comedy Central comedian Stephen Colbert? Although Cain suspended his campaign last year, his name remained on the South Carolina ballot. Colbert said he wanted to enter the GOP primary contest in South Carolina as a write-in candidate, but the state law prohibits the practice. Comedian Stephen Colbert holds a rally with former GOP presidential candidate by telling the audience he came there to "praise one man," Mr. Herman Cain. So Colbert encouraged voters to select Cain as a stand-in. The pair appeared together on Friday, one day before South Carolina's primary, at a rally at the College of Charleston. "Herman is the only former candidate who truly shares my values. It's like our values were separated at birth. And our ethics are at least first cousins," Colbert told the crowd. College officials say more than 5,000 people attended the event. More than 6,000 people voted for Cain, according to the Associated Press, with results still pouring in on NPR's live blog. That's more than double the amount of votes Rick Perry received. Perry only recently quit the race on Thursday. It's also thousands more than Jon Huntsman who also ended his campaign this week. According to the Associated Press, Cain received 45 votes in Iowa's caucus and 160 votes in New Hampshire's primary, both held in January before Colbert called on South Carolina voters to support Cain. In New Hampshire, Cain got 0.1 percent of the vote — that means his South Carolina showing was 11 times better. Before leaving the stage Friday, Colbert reminded the audience to vote. And Cain told the crowd, "We the people are still in charge."